Most of the people I hung out with were friends Justin made the previous year, including Dawn who rode up on her fuzzy-blue, fur-lined bike on our second day to say hello and invite us to her birthday celebration the following evening. Bikes are almost a necessity for navigating the temporary city’s 13+ mile-long ring roads that enveloped center camp. Temperatures were too hot during the day and too chilly at night to spend them walking to and from camp. It was especially chilly at night to emerge from the camps into the large open space surrounding the Burning Man structure, or when pedaling between the music camps stationed on the outskirts of the ring roads as temperatures went as low as 40°F. My first night I was anxious to get out and explore. It was dusk by the time we found our campmates and unpacked. 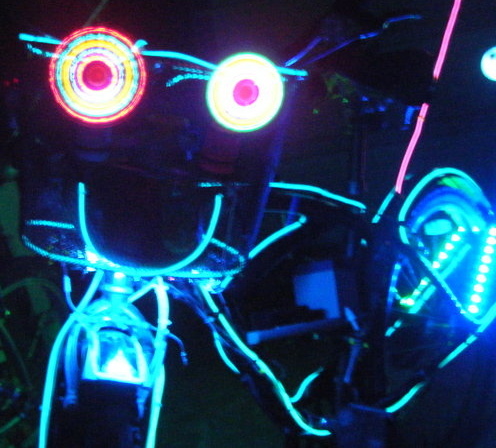 Randy pulled out my bike and I attacked it with glow sticks and the orange EL wire Justin and I had purchased. Randy, an engineer and all-things-glowy-rigged expert, had an aqua-lit pole on the back of his bike with a spastic flashing hummingbird on the end. On the front of his basket were two spinning eyes and an equalizer-style mouth that opened and closed randomly depending on what music we were near. We rode out first to Opulent Temple, one of the major music venues. 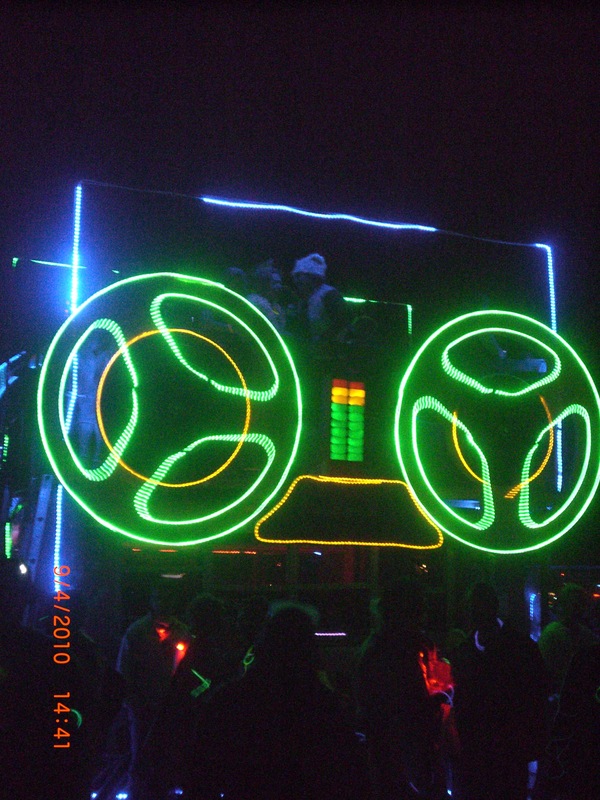 The DJ booth, which had fire blazing from the top, was sandwiched by 15 foot circular screens taut around a metal frame which made them look like drums lying on their sides. We stood on the outskirts of the crowd. I kept spinning around digesting everything I was seeing. People in costume, lit up art cars in the shapes of butterflies, a cassette tape, a field of mushrooms, all floating around off in the distance somewhat surreal. I pointed to the Art Car Wash, an elaborate series of scaffolding with a large orange cone in the center and bubbles coming out of it. I peddled off vigorously, fighting against the dust pits that slowed me down. My excitement gave my legs power and when I arrived I turned around to make sure the guys had kept up, but there was no one behind me. I stopped, wildly scanning all the glowing movements, looking for the hummingbird. It was my first night. I had no idea how to get back to our camp. I was lost. I stood there for what seemed like ages, but was probably only five minutes, before deciding to head back in the direction I’d come. I couldn’t wait any longer. There was too much to see and I didn’t want to spend my time standing around. Halfway back I saw the outlines of three men, standing beside their bikes, looking off in another direction. I ditched my bike and ran towards them. They embraced me with sighs of relief. I was only lost for a moment.